After years and years of failed legislative attempts to legalize medical marijuana in Utah, supporters are now trying to take the issue straight to voters. The Utah Patients Coalition held a Monday news conference at the state Capitol and afterward delivered its proposed initiative to the lieutenant governor’s office with patients, caregivers and supporters in tow. If the wording of the initiative is approved, backers must hold seven public hearings throughout Utah and collect 113,143 signatures from registered voters around the state to get the question on the November 2018 ballot. The proposed law uses much of the same language as former State Sen. Mark Madsen’s SB73, which nearly passed in 2016. If the initiative wins voter approval,smoking marijuana would still be prohibited. So, too, would driving while intoxicated with medical cannabis. And there would be limitations on the number of cannabis facilities allowed and physicians permitted to prescribe medical marijuana. Topicals, oils, edibles and vaping would be allowed, but no use of medical marijuana could occur in public view. Some of the qualifying illnesses included in the proposed law include Alzheimer’s disease, cancer, multiple sclerosis, post-traumatic stress disorder, chronic pain and autism. Madsen, who is preparing to move abroad, attended the conference and said he has high hopes for the initiative. If voted into law, dispensing in Utah would begin January 2021 and patients would receive their medical marijuana cards January 2020, said Connor Boyack, president of Libertas Institute who personally consulted with the political issues committee (PIC). If the initiative passes but the state fails to implement the system it envisions, the law also stipulates that patients could grow their own marijuana outside of residential areas. In 2014, the Utah Legislature approved a narrow bill allowing patients with severe epilepsy to acquire cannabis oil and this year passed a bill calling for more research on medical marijuana. But its continued rejection of wider access has provided a dose of reality, said advocate Christine Stenquist. There is no specified amount of time the lieutenant governor’s office can take to review an initiative once it is submitted, said Mark Thomas, state director of elections. Review times can vary depending on the length of the wording of the proposed law, the topic and whether staffers need to request assistance from other offices. If accepted, the initiative application will be sent to the governor’s Office of Management and Budget to create a fiscal estimate of the impact of the law. After the estimate is complete, organizers must hold seven public hearings throughout Utah before collecting petition signatures. The number of required signatures represents 10 percent of Utah votes cast in the 2016 presidential election statewide and in at least 26 of Utah’s 29 Senate districts. Signatures for each Senate district must be submitted to the county clerk’s office by April 15, which will verify that signatures came from registered voters. DJ Schanz, executive director of the coalition, said it hopes to have signatures collected and filed by Jan. 1 before the Legislature starts. Schanz said organizers need to raise about $3 million to fund the effort. The coalition raised about a third of that, he said, before submitting the initiative Monday. Several organizations plan to help with signature gathering, including the social media education group called Utah Residents for Medical Cannabis. Tremonton residents Debbie and Monte Hoskins, members of that group, expect to use their personal story to help Utahns understand the necessity of medical marijuana. While living in Colorado, Monte Hoskins tried medical marijuana for a 20-year-old back injury. It helped him cut his opioid intake in half, he said, but he had to quit using it upon moving back to Utah. A Dan Jones & Associates poll commissioned in January by The Salt Lake Tribune and Hinckley Institute of Politics found that 54 percent of Utah voters somewhat or strongly approved of medical marijuana legalization in the state. Some 43 percent somewhat or strongly disapproved of legalization. Advocates hoped for legalization in 2016 with two bills that would have set the groundwork for medical marijuana regulation and cultivation. But lawmakers killed the bills in the final hours of the session. Rep. Brad Daw, R-Orem, is surprised the ballot initiative is moving forward, given that there is research happening through a bill he sponsored last session calling for more in-state research of medical marijuana. 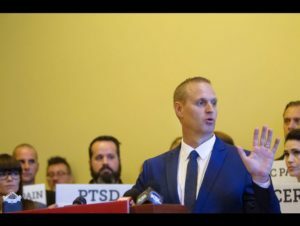 He said current research efforts, including a study at the University of Utah of chronic pain, and work with the Cannabinoid Product Board could lead to legislation legalizing some medical marijuana products as early as next year. Daw is concerned the ballot initiative could “spook a lot of people he has tried to get on board” and is worried future legislation could get caught up in initiative efforts. Utah’s predominant faith, The Church of Jesus Christ of Latter-day Saints, opposed Madsen’s bill in 2016, fearing “unintended consequences” from medical marijuana. 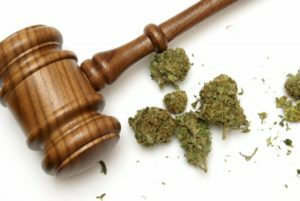 On Monday, church spokesman Eric Hawkins pointed to Daw’s measure as striking a balance between boosting research and understanding any challenges that could come from legalization. Studies can take years to conduct, and there are several hoops researchers need to jump through to even start studying medical marijuana, including multiple federal applications with months long waiting periods for approval. 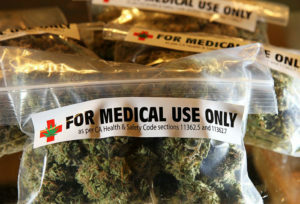 The Utah Medical Association, while supportive of more research into the medical uses of marijuana, is concerned about making a medicine available for prescription and use through legislation or by vote. Paul Clayton, president of the association, said opening up marijuana to the public to treat all kinds of medical conditions may be fraught with hazards. As of April, 29 states, the District of Columbia, Guam and Puerto Rico have legalized medical marijuana, according to the National Conference of State Legislatures, including three of Utah’s border states — Arizona, Colorado and Nevada.